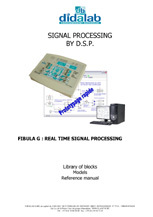 ▪ Extract from the user manual of the Real-time DSP signal processing kit. ▪ Complete listing of the graphical functions (FibulaG software). ▪ Possibility to create new graphical functions. For the ETD410 module . ▪ Master/Slave RS/JK flip-flops and D flip-flop. ▪ Synchronous Binary-to-Decimal up/down counters. 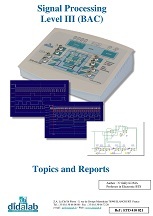 ▪ Digital-to-Analog Counters (DAC) & Analog-to-Digital Counters (ADC). ▪ Tracking converter, semi-flash ADC. 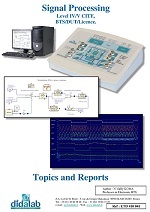 The topics from the manual are intended for students from technological high schools (international levels IV and V).